A major new Aboriginal art exhibition featuring 50 new and commissioned works from across the vast APY Lands of South Australia will open at the Hazelhurst Regional Gallery in Sydney's south this weekend. Nganampa Kililpil: Our Stars brings together artists from seven art centres: Tjala, Ernabella, Mimili Maku, Tjungu Palya, Ninuku, Kaltjiti and Iwantja - each known for their strong use of colour and dynamic movement. The show will feature two 3x5 metre collaborative paintings by artists from each of the art centres. 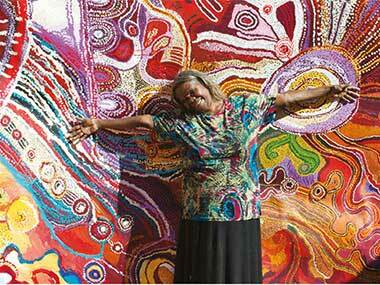 It is the first time artists from across the APY Lands have worked together on a single painting. The women’s collaborative painting, created by 24 artists, "Focuses on the Seven Sisters Dreaming the significant sites and landmarks that were created or visited by the sisters as they travelled through the landscape," explains curator, Carrie Kibbler. 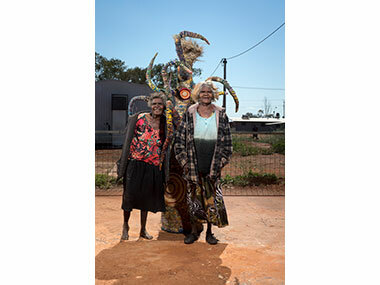 "And the accompanying installation, Punu Katjara (Two Trees), was created by 38 weavers and malpas (helpers), and reflects the vast and abundant country with the trees being the spirit of life who are surrounded by animals and bush tucker." The men's’ works, produced by 21 artists, includes a collaborative painting and installation of Kulata (spears) and Kulata Miru (spear throwers). "These powerful and poignant works reflect on the senior men who have passed away and acknowledge their contribution to art and culture in the APY Lands," says Kibbler. "Drawing on traditional skills of spear making and wood carving, the Kulata Miru feature the names of the passed away senior men carved into the decorated surfaces." The exhibition features weaving and shell art workshops, as well as a weaving demonstration by Tjanpi weavers and a Star Gazing event (at Green Point Observatory, Oyster Bay, Tuesday 29 November). Giving a talk at Sunday's opening will be Hetti Perkins, Nyurpaya Kaika-Burton (Tjala Arts) and Nici Cumpston (Curator, Art Gallery of SA). 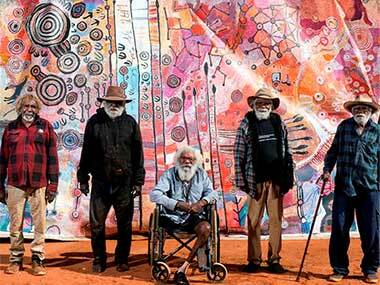 The film Putuparri and the Rainmakers will also be shown on Sunday at 2.00pm. Hazelhurst Regional Gallery & Arts Centre has a fascinating history. It began life as an organic farm by avant-garde couple, Ben & Hazel Broadhurst. It was the deaths of the young Ben Broadhurst's only brothers during WWI (Maurice died scaling the cliffs at Lone Pine and Jack was killed in action in France two years later) that seems to have shaped Ben's life in an extraordinary way, he developed a keen interest in psychic phenomena which saw him become President of the Sydney Centre for Psychic Research in the '50s. He was also egalitarian; rather than sell his profitable shirt-making business he left the machinery to his staff to either sell or to start their own business. Ben Broadhurst bequeathed his Gymea home to the Sutherland Shire which has developed it into the Gallery it is today. It sits on 3.5 acres of gardens.